Just to clarify the difference between Repairs and Servicing? A repair is when you have a problem with your amp i.e. it doesn’t do what you want or not quite right. I can Repair most types of amps; provided the fault is repeatable. Some repairs are so big that they move in to the category of complete restoration, see below for details. Servicing is a check over and some preventative maintanance of the amp intended to keep it running at its best and prevent repairs. I encourage valve amp users to consider a service once in a while but for solid-state amps (transistor/MOSFET) amps I personally don’t think it is worth while except for amps where there is fan fitted. The re pair process consists of two stages diagnosis and repair. Repair is a predictable cost but diagnosis is not. In 95% of cases I work out a the cause of a fault and make a repair in two hours. I never spend long on a job without the client’s express approval and understanding of the cost. When replacing parts I always endeavour to use exact manufacturers original parts, or superior equivalents. 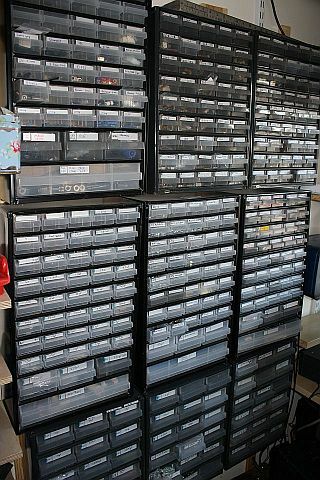 In the case of some Amp manufacturers, where I am a recognised Amp tech, I have access to their original parts catalogue (Marshall, Roland, Peavey & Vox etc). Where original parts are not so easy to come by I use superior equivalent components from accredited electronics suppliers like RS Components, Rapid Electronics and Farnell/CPC as well as the specialised audio suppliers like Audio Cap for capacitors like Orange Drops, Spragues, Bluebell Transformers and Living in the Past for transformers and HotRox, EdiCron for valves, or tubes. I don’t use imported parts where there is a risk of counterfeits. This has become a massive problem in recent years with well known auction sites and other virtual warehouse shops named after jungles- you know who. I carry many parts in stock including the common valve types, Marshall pots and jacks, fuses, discrete components. and hardware. 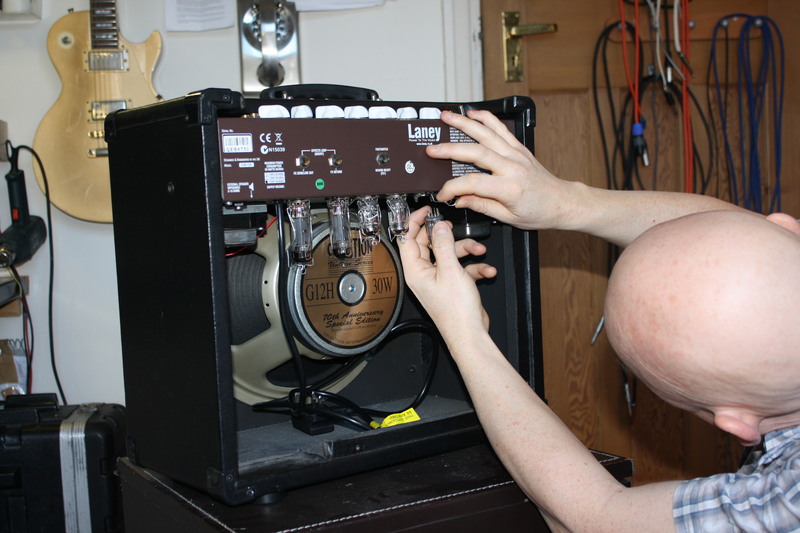 Amp Restoration is where the amp is either in an unknown state or has numerous faults. I have see a few recently where a birds nest needs to be removed before diagnosis starts. Restoration of old classic amps like vox, Marshall, hiwatt is still possible thanks to custom transformer a vibrant repair world where Internet folks share their experiences. Complete restoration can take many hours of work but it is often worth it as old amps attract a premium price. Typically worth doing on old Copicats, AC30, Hiwatt, Orange and other great vintage items. Recommended for touring or regularly gigging musicians who need to rely on their equipment. Servicing consists of a check over the amp and the remedy of a few small faults. See my price guide for details and examples.